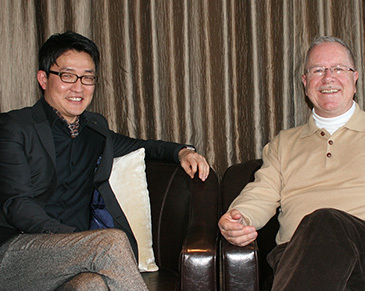 Mr. Sante Ahn (left), general manager of Banyan Tree Club & Spa Seoul poses for camera during the recent interview with President Alan Timblick of The Seoul Times at his hotel. Banyan Tree Club & Spa Seoul is being reborn as the best luxurious resort hotel in South Korea at the hands of its general manager, Mr. Sante Ahn. Mr. Sante Ahn, general manager of Banyan Tree Club & Spa Seoul, returned to Banyan Tree after almost a decade of his service overseas. He was instrumental in the opening of The Cove and Saffron restaurants in Banyan Tree Bintan. He shouldered an impressive responsibility for the food and beverage opening for Angsana Bintan as well. His role was critical at many other places: at Anigua (Carlisle Bay), W Seoul Walkerhill, the Ananti Kumgang Mountain in North Korea, and most recently, and at the Ananti Club in Seoul, South Korea under GHM. Now Mr. Ahn is back to Seoul to help lead Banyan Tree Club & Spa Seoul by putting innovative ideas into the hotel and by reforming the overall system. The Seoul Times recently met with Mr. Ahn to find out how the resort hotel is being transformed into new “Banyan Tree” under his leadership. The following is the full text of his interview/ questionnaire. Q1: Firstly, we would like to thank you so much for this interview opportunity. Also heart-felt congratulations on your inauguration as the general manager, although belatedly. When your hotel was reopened as its current name it was praised by both domestic and international media including famed travel magazine “Destin Asian” an event by CNN. What makes your hotel so special? Could you comment on the beauty and strength of your hotel? A1: I would say that our hotel’s biggest strength is its location. Overlooking Seoul’s picturesque Mt. 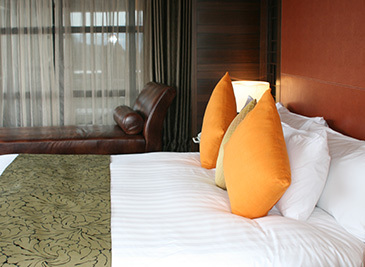 Namsan, Banyan Tree Club & Spa Seoul is located an hour’s drive from Incheon International Airport, and just 10 minutes from the lively beat of downtown Seoul. Hotel offers guests a welcome chance to escape the city’s hustle and fast pace, and to simply relax with family and friends amidst the serenity, greenery and natural beauty of Mt. Namsan. If you feel like enjoying the city of Seoul, you can just go out for shopping and dining. Dongdaemoon, just minutes away from the hotel, is one of the trendiest shopping and entertainment districts of Seoul, and is popular among local and foreign shopaholics. Across the Han River, Garosu-gil is also a good place to experience latest trends of Gangnam. Lined with Asian and European fusion restaurants and cafes, latest fashion and designer clothing and accessory boutiques, art galleries and nightclubs, it is particularly suited for trend-spotting. Q2: Some Korean old timers who knows your hotel with its old name “Tower Hotel.” But your hotel has gained a huge fame in the past couple of years since its opening. What are your plans for making your hotel even more famous and special during your tenure as its general manager? A2: Yes, it is still well known as Tower Hotel, but I think it’s among a group of old timers. Since grand opening, June 2010, Banyan Tree Club & Spa Seoul has built a positive reputation in Korea and it was around our club member and young and trendy people. It’s been three years since Banyan Tree Hotels and Resorts group had opened its first property in Korea, and now it’s time to appeal to not only specifically targeted people but also all ages and social groups to gain name recognition. I will have to come up with a novel idea to provide guests special experiment and try to improve the service quality encouraging our associates. Q3: We heard that your hotel has many famous spots including “Banyan Tree Spa,” an open-air swimming pool “The Oasis,” and “The Fiesta Bistro & Bar.” Amongst various restaurants and facilities what are the ones you would proudly introduce to the customers and our readers? A3: One of the most beguiling centerpieces of Banyan Tree Club & Spa Seoul is its expansive outdoor swimming pool, dubbed The Oasis, which perfectly complements Namsan’s natural ambiance. As Banyan Tree Brand is very famous for Spa, I would proudly introduce Banyan Tree Spa to Korean customers. By taking spa treatment at Banyan Tree Spa, you will experience everything of Banyan Tree brand. Like the tropical and sacred tree that inspired its name, Banyan Tree Spa is an intimate retreat that blends romance and serenity with exotic sensuality, providing a sanctuary for the senses. A pioneer of the tropical garden spa concept, it is a haven for physical and spiritual renewal. Using a ‘high-touch, low-tech’ approach that celebrates human touch coupled with the use of natural herbs and spices and aromatic oils, the exotic treatments. Q4: You have already been introduced to the local media as a very successful general manager. I am sure that a number of young people fresh out of college want to work in the hotel industry, dreaming of becoming successful hoteliers. As a role model, what advice would you like to give to them? A4: I think hoteliers’ personality has to be gentle and sincere, that’s all. People who have got good consideration for others could be good hoteliers. When hoteliers provide service in their sincere attitude, guests will be impressed. Knowledge and skills can be learnt and acquired working at a hotel. Also gaining global experience is one of the important requirements. Hotel is a place where you meet various cultures and people. In order to provide comfort for them, understanding the customers, multi-cultural experience is of the main factor to be prepared when you become a General Manager. Q5: As I understand you have abundant experience with foreign countries, particularly with many posts of Banyan Tree Hotels & Resorts. And I am sure that your international experience can be the competitive edge for your hotel. A5: I returned to Banyan Tree Hotels& Resorts after almost a decade. I was instrumental in the opening of The Cove and Saffron restaurants, which is a signature restaurant for the group in Banyan Tree Bintan, after which I took overall responsibility for the food and beverage for Angsana Bintan. I was then transferred to Banyan Tree Seychelles to lead the opening and manage subsequent operations of the food and beverage department, until I left the group in 2003. I went on to opening/operational assignments in Caribbean (Carlisle Bay) with Campbell Gray Hotels & Resorts, W Hotel in Seoul, The Ananti Kumgang Mountain in North Korea, and most recently, The Ananti Club, Seoul, South Korea under GHM (General Hotel Management). Q6: Much part of your professional career was spent in this craft, I presume. What made you decide to involve yourself in the hotel industry? Were there any special occasions? A6: It was during my school years. My elder sister had an engagement party at a hotel and I could see many professional hoteliers organized the event successfully. At that time I didn’t know who hotelier is and what they do, but I just thought that they looked fantastic operating events very systemically and acting professionally. The experience on the day caused me to think of being an hotelier. I decided to study at SSTH (Swiss School of Tourism and Hospitality) when I was 20. Q7: Could you tell readers about your professional and academic career? What are the secrets of your success in the hotel business? A7: I studied at Swiss School of Tourism and Hospitality (SSTH), an institution of higher education located in Passugg in Switzerland. The fields of study include tourism, gastronomy, hospitality and management. The former hotel in Passugg serves as the educational facility for the 500 plus students from more than 40 nations. Q8: I am sure that our readers are also curious about your personal life. How do you maintain your health? What are you hobbies? A8:Two Siberian huskies are living with my family and I go for a walk with them in the park near my house. I have moved to the suburbs, because of the dogs. Also I enjoy taking pictures. It is a critic for me to maintain my mental health being an hotelier. Being in nature environment with family and animals is helping me a lot. Q9: Last but not least, could you tell us more about your family? Are you married? What are your family members doing for a living?